Users with elevated security rights can modify and add report categories to match their business needs. This option is available on the Reporting tab of the System Settings dialog box, which is accessible in the Settings area. Contact your system administrator if you do not have access to this area. In addition to providing local groupings for reports, the categorization feature provides other options, as described in the following table. Forms For Related Record Types This option is selected by default and allows a report to be run from within a record. 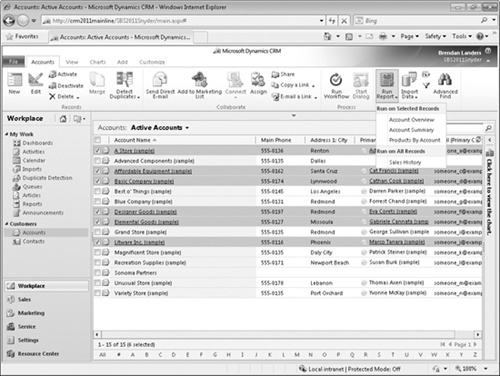 For example, the Account Overview report can be run from within an account record. Lists For Related Record Types This option is selected by default and allows a report to be run from the grid toolbar. Again, the native Account Overview report can be run from account grids. You can select multiple records to include in the report, or run it for a single record. 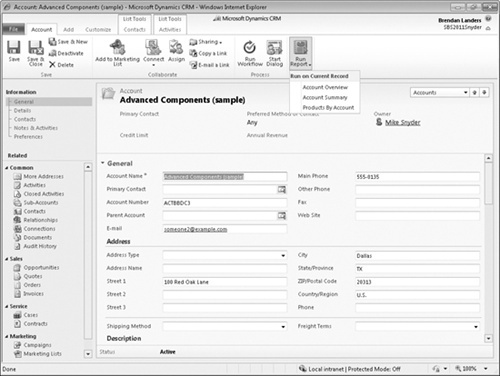 SET UP Use the Internet Explorer web browser to navigate to your Microsoft Dynamics CRM website, if necessary, before beginning this exercise. In the Workplace area, click Reports . Select the Active Opportunities by Owner report without opening it, and on the ribbon, click the Edit button. In the Categorization section, in the Categories field, click the ellipsis button. 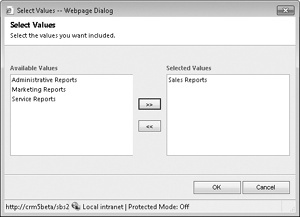 The Select Values dialog box appears. In the Available Values section, click Sales Reports, and then click the right arrow button to select the value. You can add multiple values to the Selected Values list to assign the report to multiple categories. On the Report form, click Save and Close to save the category selection. 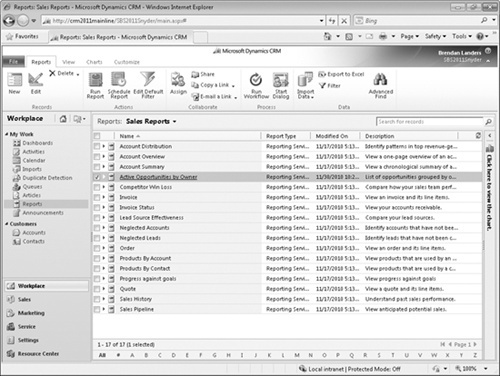 In the Reports grid, in the view selector, select Sales Reports. The Active Opportunities By Owner report now appears in the sales grouping.